Premium Plus Rose, Colour: Pink, Breeder: Terra Nigra, Stem Length: 40-70cm, Vase life: 10-12 days. Regular Rose, Colour: Pink, Breeder: Rozen Tantau, Stem Length: 40-70cm, Vase life: 11 days. Premium Plus Rose, Colour: Lilac-light Purple, Breeder: Stem Length: 40-60cm, Vase life: 14 days. Premium Plus Rose, Bi-Colour, Breeder: , Stem Length: 40-60cm, Headsize: 4.9 x 3.0 (cm). Regular Rose, Colour: Purple, Breeder: Kordes, Stem Length: 40-60cm, Vase life: 12-14 days. Premium Plus Rose, Bi-Colour, Breeder: Schreurs , Stem Length: 35-80cm, Headsize: 5.0 x 4.0 (cm). Premium, Large headed Rose, Colour: Hot Pink, Breeder: Schreurs, Stem Length: 35-60cm, Vase life: 10-12 days. Regular Large Headed Rose, Colour: Pink, Breeder: Lex+, Stem Length: 40-70cm, Vase life: 16 days. Regular Large Headed Rose, Colour: Pink, Breeder: Kordes, Stem Length: 40-70cm, Vase life: 16 days. Regular Large Headed Rose, Colour: Pink, Breeder: Kordes, Stem Length: 40-60cm, Vase life: 16 days. 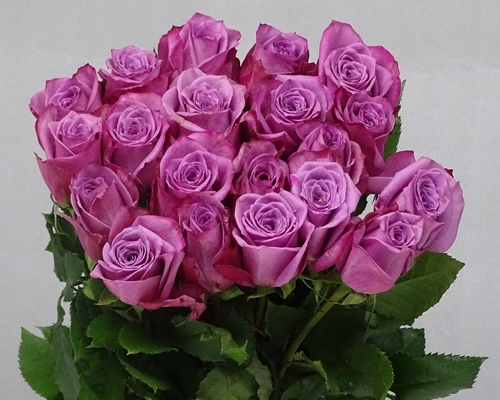 Regular Rose, Colour: Lilac, Breeder: , Stem Length: 40-60cm, Vase life: 12-14 days. Regular Large headed Rose, Colour: Pink, Breeder: Kordes , Stem Length: 35-80cm, Vase life: 16 days. Premium Large Headed Rose, Colour: Cerise, Breeder: Kordes, Stem Length: 40-80cm, Vase life: 15 days. Regular Rose, Colour: Dark Pink, Breeder: Kordes, Stem Length: 40-70cm, Vase life: 16 days. Spray Rose, Colour: Red, Breeder: Interplant , Stem Length: 40-70cm, Vase life: 10-12 days. Spray Rose, Bi-Colour Pink, Breeder: Interplant, Stem Length: 50-70cm, Vase life: 12 days. Regular Rose, Colour: Light Pink, Breeder: , Stem Length: 40-70cm, Vase life: 12-14 days.